America is a vast country covering thousands of square miles of land that traverses tremendously diverse climate and landscape. From high and majestic mountains, to wide deserts to vast fruitful plains that seem to go on forever, the sheer size of the physical landscape of America is breath taking. Obviously, this was not always the case. When those earliest settlers landed on the east coast and carved out their stark settlements, they had no idea of huge expanse of land that lay to the west. It took the bold explorations of surveyors such and Lewis and Clark to report back how stunningly huge the amount of physical space that was available for America to inhabit. At first, the very idea of becoming a nation was seemingly impossible for the early settlers to grasp. They came here to escape persecution, tyranny or to make a new home for their families. If they could have looked a few hundred years down the line into the future and seen the powerhouse of a nation that would grow up from their work in those early years, they would have been stunned that this country grew to be such a world force. So the earliest challenges of settlers and early leaders of the citizens of the young America was to grasp the scope of what they were about to set about to achieve. But grasp that scope they did. 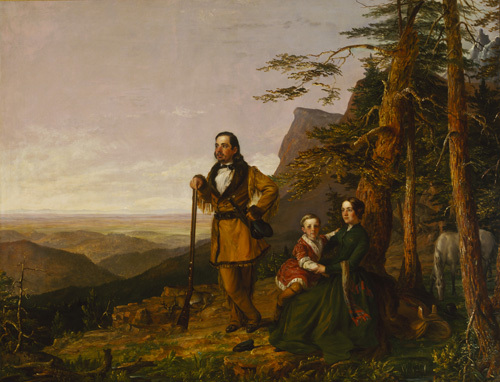 It seemed that the physical majesty of what was to become the nation of America inspired a concept that was just as grand as the land itself and that was the concept of Manifest Destiny. 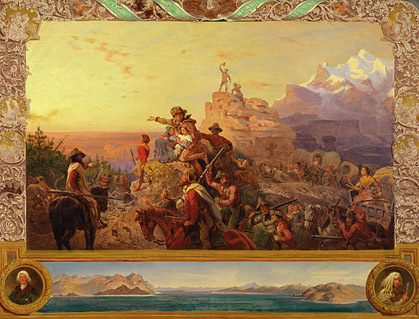 Manifest destiny was the force that drove those settlers and explorers to drive their wagon trains across sometimes impossible terrain through difficult weather conditions and facing many dangers from animals and Native Americans alike to build a nation that spanned form the Atlantic to the Pacific oceans. This was the dream of the early settlers of this country. They did not just see a new nation but one of importance, of an almost holy calling to become a virtual utopia of democracy and opportunity. And part of that utopian vision was the idea of a nation that spanned ocean to ocean and from Mexico to the Canadian border as well. When you think about it, its phenomenal that a people who did not have space photographs of a landscape or high speed travel such as is common today to get a vision of a unified nation of such vast size and scope. But it was more than just physical size that spoke to the hearts and souls of those early Americans. Manifest Destiny spoke to a vision of greatness for America that was birthed in the hearts of even these early citizens. The size of the country was to be a reflection of the majesty of the human spirit and the magnificence of the American experiment to build a nation built on freedom, the will of the people and on democracy and opportunity. Today such concepts seem ordinary and for that we can thank the early founders of this country for catching that dream together and making it a reality. Many have criticized Manifest Destiny as greed or empire building. And to be sure, mistakes were made and many people died or had their individual destinies hurt in the wholesale rush to the west that America experienced in its early decades. But what is not diminished is that sense of calling and that sense that America was put here for something great. That calling lives still in the hearts of all true Americans as we find out how we too can help our country fulfill its Manifest Destiny to be a voice for freedom and liberty in the world. Let’s hope Americans never loose their sense of calling and destiny. Because if that dies away, something holy and magnificent will die with it.